When it comes to smartphones, Huawei, the third largest smartphone vendor in the world, might not have the kind of range that Samsung’s stable of smartphones carry, but it is no pushover, either. In fact, the company has rolled out a number of Ascend products in the past such as the Huawei Ascend P2, and this time around they have taken advantage of IFA 2014 to reveal the Huawei Ascend G7 smartphone. One thing is for sure – the moment you lay your eyes on the Huawei Ascend G7, chances are you will be pleased with its aesthetics. After all, it does come with outstanding craftsmanship and ships with a 5.5-inch High Definition display, sports enhanced 4G LTE Cat4 connectivity for speedy online performance, and carries an optimized 13MP rear-facing camera, The Huawei Ascend G7 is a surefire stunner, letting you work smart and play hard, making it one of the more impressive mid-range smartphones that are out there in the market. 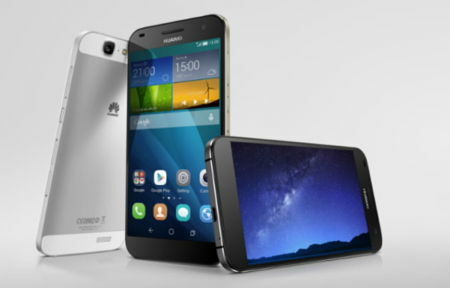 Measuring just 7.6mm slim and tipping the scales at 165 grams, the Huawei Ascend G7 is made using the world’s leading Nano Molding Technology (NMT) in order to come up with a premium metallic unibody design as well as sleek frame, delivering a richer texture and smoother touch. Those who are interested will be able to choose from classic metallic colors such as moonlight silver, space gray, and horizon gold. Underneath the hood of the Huawei Ascend G7 lies Qualcomm’s powerful quad-core 1.2GHz processor, a robust 3000 mAh Li-Polymer battery, a 13MP rear-facing camera that has an impressive 28mm wide-angle BSI lens, a 5MP front-facing camera with an 88-degree wide-angle lens, and the EMUI 3.0 intuitive user interface, among others. The asking price? We are staring down at 299 euros for the Huawei Ascend G7 when it is made available Germany, Italy, Spain, Denmark, Hungary, the Netherlands Turkey, Poland, Norway, South Africa and Mexico from this month onward, while other markets are set to follow later.